This month has been one of surrendering to the chaos and appreciating it for what it has provided: opportunities to learn by doing. Since our last update, we’ve conducted Stories of Us workshops with five organizations, reaching a total of 136 participants, and unearthing stories from far and wide. These workshops took place in LINC classes, community centres, and in the cozy living room of a generous community organizer. They ranged from a rushed hour and 15 minutes squeezed into a LINC class, to a more leisurely four hours on a weekend afternoon. We have been validated in our penchant for storytelling, and we have been coached by our participants and community partners on how we might make it a more accessible, inclusive, enjoyable, and effective experience. We’ve learned that sustained engagement is important when it comes to building trust and unpacking one’s story. We’ve learned that the space we create in our workshops – where people are given the time, space, and permission to revisit and reflect on their journeys – is rare in the lives of newcomers. The moment they leave, they have to pick up their children, go to their jobs, be strong for their families, and figure out what’s next. There’s often no time to take home a workbook and write out their stories on their own time. We’ve learned that part of our responsibility in opening people up to share their stories, is to help them close up in a way that makes them feel like they are ready to leave the space. 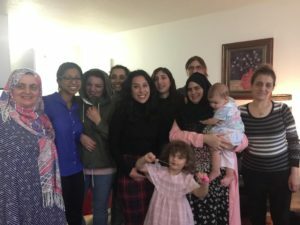 We’ve learned, through sitting in on English Conversation Circles and ESL Book Clubs at the library, that people show up regularly and enthusiastically for learning and sharing that happens in social, non-classroom settings. We’ve learned that the next iteration of the SoU workshop, which we’ll be prototyping in the new year, is a series of workshops. One that allows participants to show up to themed weekly storytelling sessions, participate in creative brainstorming activities around the theme, write the part of their story that relates to the theme, and share it with their fellow participants. By the end of the series, participants will not only have written the content of their storybooks, but will ideally have found a sense of community and togetherness with their fellow peers. Oh, and there will be a graduation ceremony. If there’s anything we’ve learned, it’s that there’s nothing like a certificate and a round of applause to bolster one’s sense of accomplishment. We’ve also learned that evaluating the impact of our projects, including The Stories of Us, will be an important and imaginative process. I say imaginative because our work doesn’t fall squarely into any pre-existing buckets, and it is up to us to envision a model that feels in integrity with the type of change we want to create. This became especially apparent when our team participated in an Evaluation Lab workshop designed to help nonprofit organizations define and measure their program outcomes. Unlike most of the other organizations participating, this was our first year of rolling out our program and we didn’t have data from previous years as a baseline for our evaluation. Furthermore, given that so much of our impact as we’ve seen it in the workshops is rooted in affect, it felt constraining to come up with observable behaviours that would confirm this impact. How might we measure “experiencing a sense of connection/community/belonging”, “increased levels of confidence”, and/or “experiencing a sense of release” in ways that feel natural and human? We’ll have to get creative, no doubt, but the workshop ultimately left us with important questions to guide our thinking. How might we embed evaluation into the workshops themselves so that participants don’t see filling out an evaluation as an additional task? Does evaluation need to be a form at all? What if we could root it in observation instead? Or, even better, how can we integrate evaluation into the storytelling process? After all, isn’t evaluation a form of reflective practice? As per usual, the number of questions outweigh the number of answers, and we happen to think that’s a great way to end this whirlwind of a year!